Go to the Hydrogeology of South Africa page. Mining is hugely important in South Africa. In 2006, South Africa was the largest producer of gold, and the fourth largest producer of coal, in the world (Usher and Vermuelen 2006). Mining has been important to the economy of Gauteng Province since gold was discovered there in 1886 – ‘Gauteng’ means ‘place of gold’. Mining has provided jobs for both local people and migrants, and contributed significantly to national revenues. The mining heyday is now over, but a few mines in Gauteng Province are still operational. These mines lie in three basins: the Western, Central and Eastern basins, in the area around Johannesburg. When they were being worked, mines had to be continually dewatered, pumping groundwater out of the mines to lower the water table enough so that miners could work the gold seams. This groundwater infiltrates from rain at the ground surface, flowing down and laterally through the natural aquifer and through the worked mine seams and shafts. After mine closure, pumping usually stopped, leaving groundwater to accumulate in the former mine workings. As in many mined areas, the mines in Gauteng Province are highly interconnected, both through natural and mining-induced fractures and worked voids. The resulting networks (sometimes called basins) of interconnected voids in the rocks may encompass several mines, so that groundwater can flow between mines. While the mines were being worked, with the water table drawn down so that the mine workings were dry and exposed to air, sulphide minerals in the rock walls – mostly iron sulphide – were oxidised to produce iron hydroxides that can be very soluble. After mining stops, this change in the minerals on the rock walls of the mine workings is very significant for water quality. Mining ended in the Western and Central basins in Gauteng Province in the late 1990s, and pumping to dewater the mines stopped. One mine, Grootvlei, remained operational in the Eastern basin, continuing to pump water from a shaft. When dewatering stopped, groundwater levels began to rise again and fill the old mine workings. This groundwater started to dissolve the iron hydroxides on the rock walls of the mine, often creating very poor water quality, including very acidic conditions. The resulting poor quality groundwater is often called acid mine drainage. The acidic groundwaters can then liberate even more metals from the rocks, including zinc and uranium. Eventually, the groundwater level in the mines can rise to a level where it flows out at the ground surface – for example, via natural fractures into a stream, or via worked tunnels. The interconnected nature of the mines and the hydrogeological system in this area, which is not well understood, means such discharges are unpredictable. The burden of dealing with mining-induced poor quality groundwater and acid mine drainage, has largely fallen on the mining companies that remained operational in the region. The first discharges of acid mine drainage in Gauteng Province happened in 2002 in the Western basin, at various locations including a well that was not previously known to be connected to the mine system. This highlights the unpredictable nature of the problem in an area where the hydrogeology is poorly understood. The social and environmental effects of acid mine drainage are linked. Outflow of acidic effluent into surface water bodies used for domestic water supplies, and subsurface flow of acid mine water into areas of aquifers where groundwater is abstracted for domestic use, has severely affected many people’s water supplies. This was the case for residents of Krugersdorp in Gauteng Province, where groundwater accessed via boreholes was polluted in 2005, including by sulphurous compounds and uranium. Borehole users reported skin problems from bathing or washing clothes in acidic water, and longer term effects are potentially more serious, including carcinogenic effects and potential organ and nerve damage. Ecosystem effects include loss of biodiversity in affected areas. Media attention has focused on hippos in the Krugersdorp nature reserve, who were blinded. Ecosystem effects have knock-on effects on tourism and on agriculture. Crops grown in contaminated soils may not be suitable for consumption. Where shallow groundwater is polluted, capillary action and subsequent evaporation can leave metal residue in soils. The meat of fish from polluted waters and of livestock watered by contaminated waters can be affected, and if it enters the food chain can cause further human health risks. Communities in areas at risk of acid mine drainage are more likely to be poor than in areas not affected, and residents are more likely to live in informal settlements, as these areas of land are not appropriate for any official functions. Many of these communities were formerly heavily employed in the mining industry, and with the end of mining now rely on subsistence farming, which can be threatened by acid mine drainage. Activism and media publicity around this problem has focused on the environmental, and particularly the surface water impacts, which are more visible and immediate. Some activists have tried to encourage more debate on longer term and less visible effects, including groundwater pollution and future human health problems. Acid mine drainage is a severe example of polluted groundwater, but as this case study shows, groundwater and surface water are linked and both can affect the other. By 2009 there were reports that the one remaining mine at Grootvlei, in the more populated Eastern basin, was in financial difficulty. If the mine stopped operating and dewatering stopped, there was a risk of acid mine drainage affecting the nearby town of Nigel, the defunct Gold Reef Mine in southern Johannesburg, which is now a tourist attraction, and the hydrogeologically-linked Central basin, where post-mining groundwater levels were already rising because there were no active mines pumping. Nearby Johannesburg is reliant to an extent on groundwater for drinking water supply, and this is also potentially threatened by acid mine drainage. In 2010, the South African government appointed an interministerial committee to investigate the major problem of acid mine drainage and recommend feasible solutions. Until this time, managing the problem had been led by the private sector, driven by government pressure – for example, in 2006, the government asked 3 mining companies – Harmony Gold, Rand Uranium and Mintall – to lead treatment of polluted mine waters at their own cost. However, in 2012 the government subsidised Rand Uranium and Mintall to expand treatment operations, and in Central Rand entered into an agreement with the companies DRD Gold and Central Rand Gold to build a mine water treatment plant. Up till then, large scale water treatment had been focused on acid neutralisation, but in 2016 the government also committed to building a desalinisation plant to deal with the residues from acid neutralisation treatment, which were also a pollution problem. The plan is for this plant to be finished by 2020 and to be two-thirds industry-funded. The slow and reactionary government response is a result of legislative, historical and political, as well as practical, factors. The laws that guide responsibility for acid mine drainage treatment and management are the Mining and Petroleum Resources Development Act and the National Water Act. The latter states that the government is the custodian of all water resources; but the Mining and Petroleum Resources Development Act states that resources must be developed in ecologically sustainable manners and ‘mining companies must contribute to the social and economic development of the places they operate in’. Implementation of these rules is weak, and government has interpreted the laws to imply that companies should pay for dealing with the impacts of acid mine drainage. However, this has been hampered by the realities of requiring currently operating companies to pay to clean up historical pollution caused by other companies which have since ceased operating. Also, there have been allegations that historical collusion between government and mining companies has contributed to the inertia in dealing with the problem. However, the reality is that industry is paying for most of the treatment of the acid mine drainage problem in this region. Water treatment cannot rectify past ecological and social damage: it can only ameliorate the effects of currently discharged polluted mine water. Nevertheless, some industry actors are optimistic about the potential for cost recovery from treated mine water. For example, the company Western Areas Gold Mine has carried out its own desalinisation operations, adding fertilizer to the treated water, and used this for high intensity drip irrigation agriculture. The problems of acid mine drainage are not limited to Gauteng province, but are seen across South Africa and internationally. Coetzee H, Hobbs PJ, Burgess JE, Thomas A, Keet M, Yibas B, Van Tonder D, Netili F, Rust U, Wade P and Maree J. 2010. Mine water management in the Witwatersrand Gold Fields with special emphasis on acid mine drainage. Report to the Inter-Ministerial Committee on Acid Mine Drainage, pp.1-128. Harvard Law School International Human Rights Clinic. 2016. The Cost Of Gold: Environmental, Health and Human Rights Consequences of Gold Mining in South Africa’s West and Central Rand. McCarthy TS. 2011. The impact of acid mine drainage in South Africa. South African Journal of Science 107(5-6), 01-07. Akcil A and Koldas S. 2006. 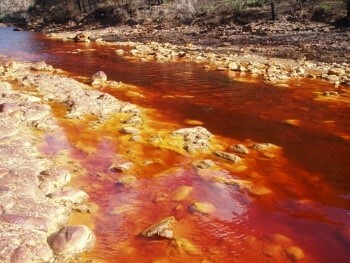 Acid Mine Drainage (AMD): causes, treatment and case studies. Journal of Cleaner Production, 14(12), 1139-1145. Oelofse SH. 2009. Mine water pollution-acid mine decant, effluent and treatment: a consideration of key emerging issues that may impact the state of the environment. The Icfai University Press. Tutu H, McCarthy TS and Cukrowska E. 2008. The chemical characteristics of acid mine drainage with particular reference to sources, distribution and remediation: The Witwatersrand Basin, South Africa as a case study. Applied Geochemistry, 23(12), 3666-3684.